Symbolic Link or symlink is a linking system within in files and directories that points to another file or directory usually in UNIX ot Unix derivative OS. Symbolic Link can be created in Windows Operating System too, beside Linux, BSD and OS X. Symbolic Link is equivalent to the word Soft Link as unlike a hard link, this reference is not equivalent to the actual file system entry in the referenced file and deleting the original file makes the Symbolic Link invalid. The advantage of using symbolic link is that these works over the partitions and are also on file system-wide they can easily point to a place which is not the case with the hard links. Although hard linking to directories in principle possible, but should be avoided and may be applied as a rule only by the system administrator. Symbolic link can confuse the users, as it seems at first glance as if the linked file is present simultaneously in multiple directories, deleting the original file, however, leads file loss. Symbolic links to the directories can be problematic when users or programs deal with clueless directory trees. This creates an endless loop and thus a buffer overflow which leads to crashes or dangerous malfunctions. Unix tries to prevent this to some degree, by prohibiting to delete a symbolic link to a directory by the system command “rmdir” so clueless symbolic links prompt an error message if when wanting to remove such a link is done. The usage is same like OS X. The command ls -l (small letters of LS -L) returns the output of the full path in both cases. Please do not request me for writing any Windows related tutorials, you can read older tutorials like listed in Windows 7 Right Click Menu Tips,Tricks and Tutorials. Any Linux or OS X requests (Server/ Desktop) is always entertained. This Article Has Been Shared 5173 Times! FAQs on Ubuntu 12.04 after Upgrading from Windows are for the new users of Ubuntu who are not even aware of small tweaks like activating transparency effect. Dock of Mac OS X is an icon of Mac itself. Dock derived from OS X’s predecessor NeXTSTEP Operating System. Dock of OS X has several discovered tweaks. ReactOS is a free operating system that is compatible with Microsoft Windows applications with the goal to complete binary compatibility for Microsoft Windows. 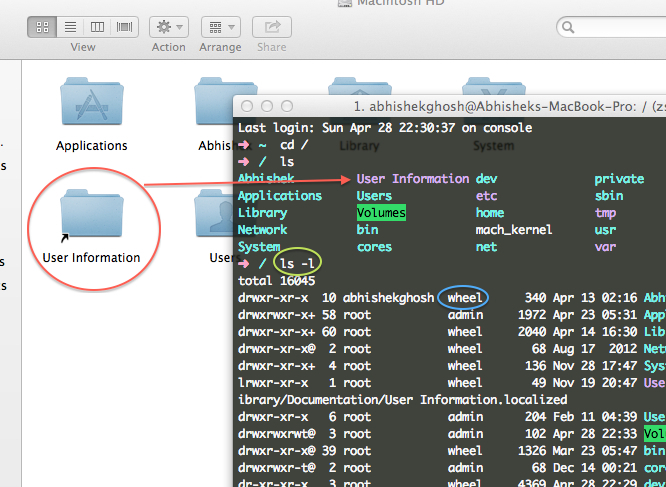 Cite this article as: Abhishek Ghosh, "Symbolic Link : Basics and Creation in OS X, Linux, Windows," in The Customize Windows, April 29, 2013, April 21, 2019, https://thecustomizewindows.com/2013/04/symbolic-link-basics-and-creation-in-os-x-linux-windows/.